RING REMNANTS The mighty ridge adorning Saturn’s moon Iapetus has steep slopes, which researchers suggest is a sign that debris falling from space stacked up and formed mountains on the moon’s surface. 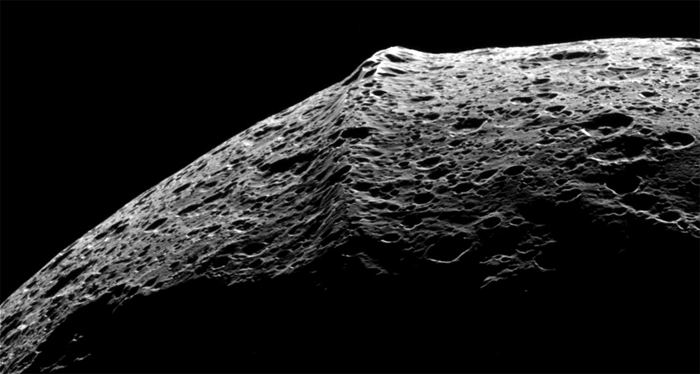 A mysterious mountain ridge ringing the equator of Saturn’s moon Iapetus may be a load of space rubble. Ever since the Cassini spacecraft spied the jagged belt wrapped around Iapetus’ middle in 2004, scientists have debated the ridge’s origin. Some think volcanoes shoved it up from beneath the moon’s surface or that tectonic activity created the range. Others think that the towering mountains, which may reach more than twice the height of Mount Everest, could be remnants of rings that once orbited the moon. The ring theory got a boost from an analysis of Cassini images by Erika Lopez Garcia of Brown University in Providence, R.I., and colleagues. Iapetus’ ridges have steep slopes, a clue that the mountains may have formed as cosmic debris rained down on the moon and piled high on the surface, the team reports April 9 at arXiv.org.